Originally from Rhode Island, John moved to Tucson with his family in 1964. He married his wife Stephanie in 1983. 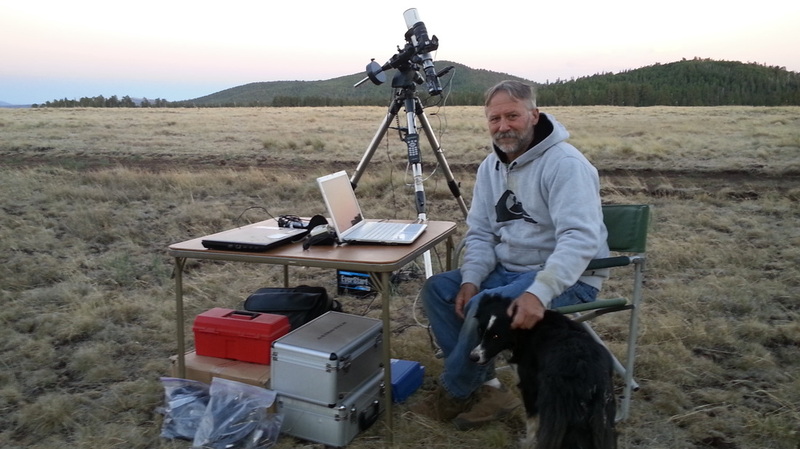 He is a general contractor by trade with a life-long interest in astronomy. In 2010, I started my journey into astrophotography and it did not take long before I became obsessed with it. Buying telescopes, mounts, cameras, etc. and getting by on less sleep notes John. In 2015, I started imaging the night sky with a wide field camera lens to get a much larger field of view than what I could get with most telescopes. Wide angle and a very fast lens make it possible to capture the Milky Way along with the foreground. Although I have no formal education in photography, I feel I have learned much with the help of others and lots of trial and error. Along the way I have (with the company of my wife) had the opportunity to travel the southwest looking for unusual scenery and clear skies. I have been fortunate to have my work published in Sky & Telescope and Astronomy magazines. As well as online NASA Astronomy Photo of the Day, Arizona Highways Photo of the Day, Astronomy Photo of the Day and others. I hope to continue my travels and add to and improve on my photos. I am still amazed at how many people have never seen the Milky Way. Often when viewing my photos, people are not sure what they are looking at. I love explaining to them what they are seeing and how, when and where they can see it themselves. I hope that by viewing my photos, people will pause to think about light pollution and what they can do to minimize its effect.